H.I.S. posted record-high sales of 728.6 billion JPY (+20.2% year on year) for the full year of FY2018 (November 1 2017 to October 31 2018) on a consolidated basis mainly because of better business results of acquiring companies the M&A effects and better results of the travel and hotel businesses. Operating income was up 13.3% to 18 billion JPY, however ordinary income was down 1.1% to 19.4 billion JPY due to exchange loss of 500 million yen. H.I.S. finally posted net income of 11 billion JPY 17.3% smaller than a year ago, because of a special loss of 3.5 billion yen related to the business suspension of Asia Atlantic Airlines (AAA). For the travel business, sales increased by 21% to 651.3 billion yen, and operating by 22% to 12.1 billion yen. Sales of overseas local companies particularly increased by 45% to 126.7 billion JPY, contributed by sales of new consolidated companies of Merit Travel and Johnview of Canada and Miki Group. Sales of the overseas travel business from Japan were up 16% to 435.6 billion JPY, boosted by higher demands for South Korea and Europe. A share of H.I.S. in terms of overseas travel sales among major 49 travel companies reached 20.8%. Sales of the inbound travel business were up 81% to 28.8 billion JPY as a result of expansion of travel products. Sales of Huis Ten Bosch were up 18% to 43.6 billion JPY and operating income was down 6% to 7.2 billion JPY. Although sales of HTB Energy were up 18%, reduction of visitors and an increase in cost on HTB Energy negatively affected the profit. 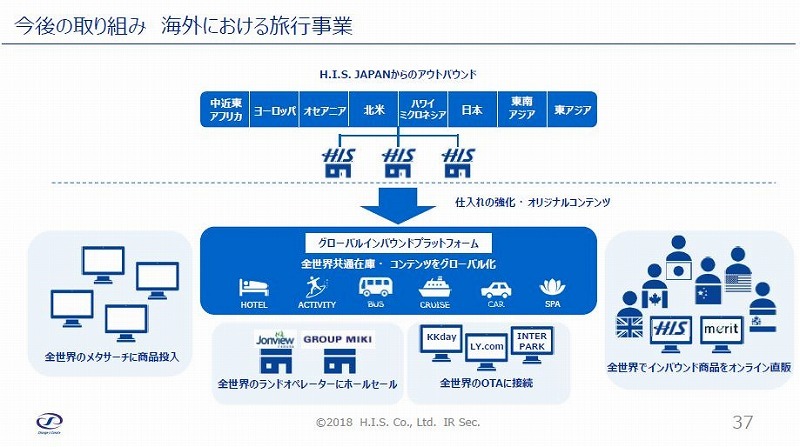 Aiming at sales of 700 billion JPY for FY2019 and 850 billion JPY for FY2020, H.I.S. will focus on increasing non-Japanese customers in the global market. Sales from non-Japanese customers accounted for 10% of the overseas travel business. 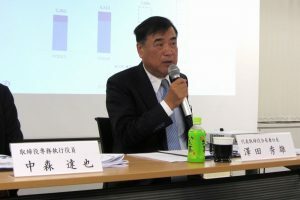 Five or six years later, the ratio is expected to rise to half of a sales goal of 1 trillion yen for the travel business. Toward the goal, H.I.S. continues expanding its business in mature markets through active M&A strategy. In immature markets, such as Asia or Middle East, H.I.S. has an idea to develop its business by itself. For the global business, H.I.S. plans to establish an online platform, on which H.I.S. original products will be sold to consumers and at the same time be whole-sold to local OTA in Asia and its overseas subsidiaries. Also, the platform is expected to be a distribution channel connecting with global OTAs and meta-searches. Full-scale operation is scheduled in 2021. For the travel business from Japan, H.I.S. places Hawaii, Europe, cruise and Okinawa as its emphasis business areas. For the corporate travel business, solution-typed business will be developed for MICE and BTM. For the inbound travel business, its original bus tour will be extended. Sawada also said of Huis Ten Bosch, the theme park in Nagasaki, “It reduced visitors in 2018 because of bad weather and reduction of population in Kyushu. We are, however, making efforts to regain visitors next year.” One of the efforts is to attract 1 million cruise ship passengers from China to Sasebo, a port close to the park, and also to organize large-scale events to attract visitors from Asia and major cities in Japan. Regarding the hotel business, H.I.S. will invest a total of 80 billion yen for the next four years to develop 100 hotels in total for next three or five years. Two years later from now, sales of 50 hotels are expected to reach 16.7 billion yen. New hotels will open in Taipei and New York in 2019 and Turkey in 2020. In addition, Sawada showed his willingness to enter a bank business, supposing a net bank for mobile phone settlement. “We pay several 100 of million yen to credit card companies as commission. If we have our own financial business, we will have a variety of merits,” Sawada added.